Learning from the Impacts of Superstorm Sandy summarizes first results from studies of Superstorm Sandy, including: tide gauge measurements of storm surge, stable isotope variation in precipitation, analysis of the effect of beach nourishment among other factors on structural damage, and comparison with past storms through sediment analysis. 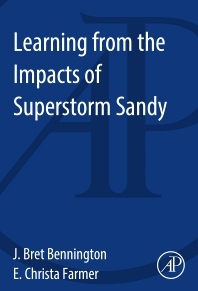 This book gives a multi-dimensional treatment of scientific results of studies of Superstorm Sandy, and it is a valuable reference for oceanographers, coastal geologists, climatologists, dynamic meteorologists, paleotempostologists, sedimentary geologists, geomorphologists and emergency managers who need to better understand the storm and its effects in order to be prepared for similar events in the future. Chapter 5: Hurricane Sandy: Did Beach Nourishment Save New Jersey? J. Bret Bennington, Professor, Hofstra University, Department of Geology, Environment, and Sustainability: J Bret Bennington earned a B.S. in biology-geology from the University of Rochester in 1985, and a Ph.D. in 1995 with Richard Bambach's paleontology group at Virginia Tech. At Hofstra he teaches courses in physical geology, historical geology, geomorphology, hydrology, dinosaurs, evolution and Charles Darwin, and paleontology. His main research focus is paleoecology and the statistical analysis of fossil assemblages. E. Christa Farmer, Associate Professor, Hofstra University Department of Geology, Environment, and Sustainability: E. Christa Farmer was one of the first graduates of Stanford University’s interdisciplinary Earth Systems program in 1994, and after working for the U.S. Forest Service and several nongovernmental environmental groups in Washington, DC, earned a Ph.D. in Paleoclimatology at the Lamont Doherty Earth Observatory of Columbia University in 2005. When not teaching introductory geology, environmental geology and natural hazards, introduction to field methods, sedimentation, paleoclimatology, or meteorology, she manages the Hofstra University Center for Climate Study and works with Dr. Bennington to reconstruct records of past hurricanes from sediment cores of Long Island’s south shore barrier beach islands.